You know those cute little State Stamps that are on page 103? Want to know a cute use for them? Well besides cards? Stamp the back or the front corner of snail mail that you are sending for a little hometown love. When I given this tip I about flipped my lid - Happy girl over here!!! Not only did I stamp the envelopes that I use to send letters to Kaela but I am also going to stamp the back of all of my Christmas cards. These little stamps are only $2.95 each so it is affordable to buy every stamp in the nation or just the states that you have lived in. What ever you do ... do not do what I did!!! I accidentally grabbed my Archival Black Stamp pad and now my stamp is forever stained black. It will not hurt the stamp, in fact now if I drop it on the carpet I will be able to find it again - but it will never again be clear. I think I will keep this little stamp in my letter writing box. 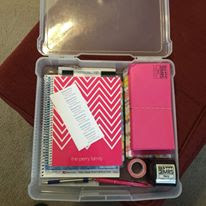 This box has my address book, envelopes, my return address stamp, some washi tape, pens, and notebook paper, and stickers. I type out and print Kaela's letters 90% of the time but if we go camping I can just grab this box and take it with us. That way I can mail letters from the road. I have mini version of this box in my travel bag that goes with me when I fly. Speaking of letter to Kaela, I guess I should go and get one put in the mail. OMG - My photo is online!!!! !